There are several opportunities to share for those of you interested in the intersection of creativity and aging. Our most recent Program E-news gives you the full scoop. The therapeutic power of art - to comfort, to heal, to elevate quality of life - has inspired human creativity for centuries. Strathmore's Arts and the Brain lecture series engages teachers, scholars, and artists working at the intersection of arts and health to present innovative, practical strategies for harnessing the arts to alleviate suffering and strengthen vitality. This new program will launch for four months on first and third Mondays starting in April to provide interactive, discussion-based experiences in the galleries for people with early-stage dementia and their caregivers. Participants explore two or three works of art during each 90-minute program and the theme changes for every session. This is a free program for individuals with early-stage dementia and an accompanying caregiver. AFTA’s 28th Annual Gala Reception, Giving Voice to Lifelong Creativity, was held in Washington D.C. at The American Revolution Institute of the Society of the Cincinnati, also known as Anderson House. Nancy Peery Marriott was honored with the 8th Lolo Sarnoff Founder’s Award, celebrating her humanitarianism, philanthropy and lifelong engagement in the arts. Gracious chairs of this year’s gala were Nancy Bliss and Ambassador Don Bliss (Ret. ), longtime supporters and active participants in AFTA. Dominic Cossa, professor of voice at the University of Maryland who has sung as leading baritone with some of the world’s greatest opera companies, presented the award. A reception for Sponsors featured a tribute performance to Mrs. Marriott of Art Song to Zarzuela by the Rómez Trio. The main reception hosted the award presentation, a touching interactive performance of lyrics set to melody from the opera, La Traviata, written by AFTA program participants from Kensington Park Senior Living, and moving remarks from program participant Karla Kombrink, whose original works of art were part of an exhibition from AFTA programs on display. Proceeds from the Gala will help AFTA provide frequent, high-quality, artist-led workshops at dozens of adult day care centers, nursing homes, assisted living, community centers and senior housing centers in the Washington metropolitan area. AFTA flips the paradigm of old age by using creativity to turn isolation, loneliness, and loss into community, access, and joy. A link to photographs from the Gala is available here and the full program from the evening is available here. The 28th Annual AFTA Gala Benefit Reception will be held on Wednesday, October 19, at the American Revolution Institute of the Society of the Cincinnati, also known as beloved Anderson House, in historic Dupont Circle (2118 Massachusetts Avenue, NW, Washington, DC 20008). A V.I.P. reception will take place from 6:00 – 7:00 p.m., and the main event from 7:00 – 10:00 p.m., including arts tributes and performances. 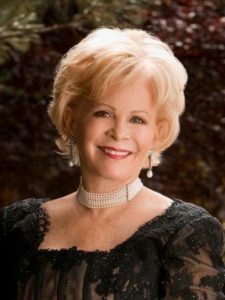 The evening's highlight is presentation of the 2016 Lolo Sarnoff Founder’s Award to dazzling soprano soloist and generous philanthropist, Nancy Peery Marriott, whose artistic joie de vivre and commitment to making the world a better place are the hallmarks of an extraordinary life—one that has done so much for the arts and for those who are more vulnerable in metropolitan Washington, D.C. as well as across the nation. Previous awardees, recognized for sharing AFTA Founder Lolo Sarnoff's humanitarianism and philanthropy, and dedication to lifelong self-expression and engagement in the arts include United States Supreme Court Justice Ruth Bader Ginsburg, USAgainstAlzheimer's founders Trish and George Vradenburg, and author and Ambassador Donald T. Bliss (Retired), among others. Award information can be found here as well as links to a Gala fact sheet, and online admission and sponsorship information. Artwork by participants in teaching artist Carol Siegel’s program at Alexandria Adult Day Services Center (AADSC) was exhibited in the Vola Lawson lobby of Alexandria’s City Hall from June 8 to June 29. A celebration of the exhibition took place in the City Hall lobby on Tuesday, June 21. Special guests included the artists from AADSC and their family members, AADSC staff members, AFTA trustees, and supporters of creative aging and the arts. Artist Barbara J. and her daughter pose with Barbara's collage "Architect's Dream". We were honored to have Alexandria’s mayor Allison Silberberg give opening remarks. Mayor Silberberg underscored the value of the cooperation between AFTA and AADSC in making a difference in the lives of Alexandria residents who are aging. Speaking to the artists in attendance, the Mayor also expressed her gratitude for their contributions to art and the City. Artist Karla K. with Alexandria Mayor Allison Silberberg. Marilynn D. with her self portrait. AFTA's partnership with AADSC spans almost two decades, and Siegel’s connection with the participants and staff at the center has strengthened into a deep bond. Participants feel comfortable sharing what is in their hearts within the safe space of the expressive arts group. Says Judith M., “When Carol comes, I am very happy. This is the only place I have the opportunity to enjoy and express myself in art.” The exhibition included a series of self-portraits, and selections from AFTA’s Dream Ship collection, which showed at the Joan Hisaoka Healing Arts Gallery in Washington last winter.